What can I say? but a huge ‘thank you’ for your certificate making me a Chaplain Emeritus of the Guild. The lovely card and your kind thoughts with your generous cheque as I retire as your chaplain was certainly “icing on the cake”. It has been a great joy and privilege to be with you over the past 14 years. I will certainly keep in touch with the Guild as you enter a new chapter with Fr. Andrew. Now that lent has started you are involved in extra services and study groups and, in due course, preparation for Mothering Sunday, passion tide and Holy week leading up to the great festival Easter. In all this busyness try to keep a time of quiet so that you can reflect on the nature and meaning of the death and resurrection of Jesus our saviour and Lord. The centre of all our devotion is the cross- ‘I’ crossed our- and it remind us that Jesus lived his life for others and that in the end involved him in suffering and death. Gilbert Shaw in his book ‘The Face of Jesus’ (a book of prayers based on the station of the cross) says that throughout his life of Jesus ‘put love in where love is not’ resulting in his suffering and death, lot divine love thought about the resurrection. May the example of our blessed lord teach us to love and so stand with him in his death and passion so that we may truly rejoice with him on Easter Day. With every good wishes and blessings at this Holy time. A baby in a ox’s stall? Becomes a child on earth for me? As many of you know I am very keen on using hymns as personal prayers and as I ponder on the words of John the Baptist and other poem comes to mind Christina Rossetti and ‘in the bleak midwinter’ the last verse could well be your prayer as you like it was Christmas day. On the 9th March we begin the penitential season of Lent when the associate ourselves with the time that Jesus spent in the wilderness after his baptism by John the Baptist. During the six weeks of Lent we will be challenged to look beyond the outward form of our various spiritual disciplines. If the essential spirit of the season is ignored we may he doing what is said but not what is meant. Furthermore our motives need to be right. Fasting is meant to help us in heart and mind to centre on God – on what he would give us, make us and do through us. Without such sincerity of spirit and purpose it could be that we are left to face not God but our barren selves. Holy Willie, said to Robbie Burns, prayed that he might shine above all other in Kirk “for God’s glory! The truth was that he looked for his own glory. Pecksniff the city schemer of Charles Dickens” Martin Chizzlewit was another of the great hypocrites of literature. The false pictures of holy Willie and Pecksniff left them with nothing but the stunted littleness of their own souls. We need to ask ourselves – will our Lenten observances open our lives to the will of God and his way? Will Easter find us more Christ like, more completely ‘temples of the Holy Spirit! May God grant that this Lent we may’ know you more clearly, love you more dearly and follow you more nearly, day by day! With all good wishes for a Holy and fruitful Lent. Now that the calendar tells us it’s December and in church we’re keeping the season of Advent our thoughts turn to Christmas and the various additional service that will demand our attention. During all the busyness of the mouth with school plays, carol services, christingles, midnight mass and the keep of Christmas day to itself it’s easy to forget the reason for our celebration. the incarnation of Jesus reminds us that the great power behind the universe, when we call god, love us so much that he became one of us, not only in the spirit, but in the flesh with all the limits and constrains us in our human bodies. That means, surely, that we are infinitely valuable to god, and isn’t that tremendous good news to celebration? It’s possible that you may not feel ready to meet god with all the extra duties laid upon you. Be of good cheer, the message of Christmas is that, out of this great kindness, meets you where you are. You don’t have to go anywhere special to find him. He knows who you are, and he knows what you need, he’s much more interested in the openness of your heart to him, then, invite him into are ordinary lives and pray that we may have the simple faith of the shepherd and the quiet trust of Mary and Josephs. With every good wish for holy and blessed Christmas and New Year. I have enjoyed watching the comedy series “Rev” on the TV and was pleased to see that one of priest advisors is the grander of the vicar of the parish where it lied before it went off to start my training for priesthood at Chichester. The series is based on the life of an inner city London parish priest and the problem he faces in a multi-cultural and multi-faith area. It’s very amusing without trivialising the characters. Back episode underlines the kind of situation that we may have to deal with in our church life. They call for understanding and openness in a fast changing world. If you get the chance I recommend you make the effort to watch “Rev” and pounder on the message it sends out to us. As Verger we are often the first person people meet when they come into church, perhaps, for the first time when attending a baptism, wedding or funeral. A emit and an encouraging word of welcome can work wonders to make them feel at home in a strange building attending a service which maybe foreign to them. In my experience Palm Sunday, Holy Week with Maundy Thursday, Good Friday and Holy Saturday is the most dramatic week in the whole of the Christian year, and the vivid contrast with Easter Day and the church made glorious with flowers and candles and triumphant hymns, recaptures in a memorable way the meaning of the death and resurrection of Jesus. After all the work and business, how lovely it is on Easter Sunday to hear again the Gospel message of acceptance, forgiveness and new life for all. Even when we have failed to live up to our calling as vergers and lost opportunities for service we are no less accepted, no less forgiven, no less embraced by the risen Lord on Easter morning. To witness both the depths and heights of Lent, Holy Week and Easter can teach us again of God’s presence and grace. Never forget whatever we are, God is God. Therefore let us rejoice and keep the Easter feast. Now that the Christmas Season is over, our thoughts turn towards Lent, which begins on Ash Wednesday 17th February. Traditionally Lent is a time when we give up things and often they are things that we know we really shouldn't do anyway. But the tradition began with more serious abstinence with genuine fasting and the wearing of sackcloth and ashes as a sign of penitence, hence its name Ash Wednesday. Fasting like prayer and alms giving, is one of the marks of religious observance, common to Christianity, Judaism and Islam. Giving up, of course, has another meaning in English. When we reach the end of our tether, when it all gets too much, there's a temptation to say "That's it, I give up" Having tried everything, we decide that enough is enough and the situation really is hopeless. Lent, when we recall the time that Jesus spent in the wilderness, is a vivid reminder that God never gives up on us. Jesus, faced with hunger and isolation and fear of the unknown, resisted the temptation to give up, to turn aside from his mission and surrender to the lure of worldly power and glory. He put his faith firmly in his Heavenly Father. Alone in the wilderness he fasted, prayed and prepared for his ministry and its inevitable outcome. In our Lent this year we can give up all forms of obvious consumption,those things we really have no need of. In prayer, we can give up asking for ourselves and instead ask what God wants of us. In helping others, we can give up thinking in terms of charity and seeing it as sharing all the good things God has given us: not just our money, but our time and our talents as well. Every Eucharist commemorates again those mind blowing events of Good Friday and Easter, the vivid proof that God never gives up on us. So let us make sure that our "giving up" in response is not just for Lent, but for life. With all good wishes and every blessing for 2010. Once again we had a very enjoyable annual dinner at all Saints’ Church, Leighton Buzzard. It was good to share a meal together with me added bonus congratulating Peter Hudson on this well earned award of life membership of the Guild. 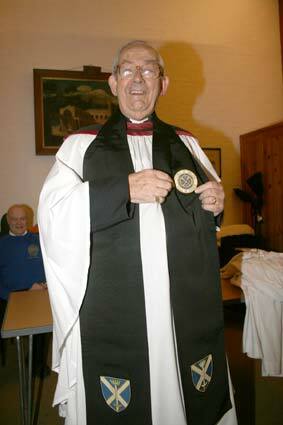 He now joins Frank Lane in the band of long serving Vergers recognised for their dedication and service. Well done both of you. Our next gathering is on Friday 21st august at the parish church of St Andrew and St Georges at Stevenage. It is the largest parish church to have been built in the country since World War II. In the past our summer outing have been to various ancient churches, your committee thought it would be interesting to visit a modern “new town” church for a change. I look forward to seeing you there. Nonita and I have just returned from a week holiday in Scarborough, a Yorkshire town and area we hadn’t visited before. Besides enjoying the town and its hills and sea breezes the surrounding countryside was beautiful and we returned home more refreshed ready to face the amours of retirement. The holiday season is upon us and whether you manage to get a break from routine in this country or abroad may you, too return refreshed in mind and body. When I was a child, a “good” Easter was measured by the number of eggs waiting on the table after the morning Eucharist. Knowing that Easter is special is achieved through a variety of different ways and means. Children with their chocolate is a start. Eggs, which symbolise the mystery of hidden life is another. Knowledge of re-creation and the meaning of Resurrection develops our spiritual growth and our theological understanding. Too much chocolate may not be good for us, but we can never have enough of Easter, however it expresses itself in our lives. Each of you will celebrate the festival with different thoughts, knowledge, insight and desires. Your journey through the past six weeks will have been varied and I hope that during that time, as you went through Lent, Passiontide, Palm Sunday and Good Friday, you experienced something of God’s love for you. The resurrection of Jesus is all about the immeasurable love freely given to us all., so I wish you all a happy Easter. Alleluia, Christ is Risen. He is Risen indeed. Therefore let us keep the feast. -when we acknowledge our failure to love God and our neighbour and ourselves, not only by what we have said and done, but also what we have failed to do. - when we count our blessings, name them and thank God for them. -when we offer intercessions, firstly, for others and finally for ourselves. I went on to suggest that when this ACTS form of prayer our hand could be used as our five fingered exercise in our spiritual life. Starting with Adoration on our thumb, and using each finger in turn ending with prayer for ourselves on our little finger. During a period of silent prayer we had an opportunity to meditate on what I had said. I look forward to seeing you all at our Corporate Communion on 27th April at 8pm. May you all have a holy Lent. Be set to hallow all we find. This could well be your prayer for the coming days and weeks. May God indeed please and guide you in the daily courses you are called to do. It was good to so some of you at our Summer Outing to High Wycombe in August. We had a most informative tour of the huge Parish church and admired the way it had been reordered to meet the needs of today. Now that September has arrived our thoughts turn to the build up to Christmas. There's the "Back to Church Sunday" on the 28th of this month when your welcoming skills are put to good use, followed by the Harvest Festival and the Bishop's Harvest Appeal to support GRAT a Christain Aid partner in Mali on the River Niger. The in November there's 'All Saints and All Souls' tide quickly followed by Remembrance Sunday and Armistice Day which this year marks the 90th Aninniversay of the end of the First World War. The season of Advent begins on 30th November and the preparations for Chrsitmas begin. I hope you manage to get some time for relaxation and enjoying a good holiday in spite of the wet weather and you are now ready to meet the demands of the next three months. With every blessing on your dedication and work in the House of God. It was good to have so many of you at St Saviours Church, St Albans for our yearly Corporate Communion with the opportunity to meet afterwards for a chat and to catch up on the news over coffee and canapés. Thank you for making the effort, it was greatly appreciated. The busy time of Holy week and Easter are now behind us and we are enjoying the beauty of Eastertide and the arrival of Spring. Seeing the new growth appearing in our gardens and countryside (yes it is new growth not last years tarted up) enforces the overriding message of Easter that Jesus was gloriously raised from the dead and so brought new life into the world. By his resurrection he has restored us to everlasting life and this belief should help to sustain and strengthen us as we face the changes and chances of this mortal life. Alleluia, Christ is Risen! He is risen indeed Alleluia. Let us therefore keep the feast. May you continue to fulfil your duties and enjoy the privileges of your spiritual home. P.S. Do you know the Verger’s prayer by heart yet? Now that Christmas and Epiphany are over and we are in the New Year of 2008, our thoughts turn towards Lent and Easter. Unlike Christmas Day, Easter is a moveable feast depending on the date of the Pascal Moon and this year the festival is almost the earliest it can be on the 23rd March and that means Ash Wednesday, the beginning of Lent is on 6th February. The season of Lent challenges us to press beyond the outward form of our various spiritual disciplines to a deeper relationship with pour Heavenly Father. For example, abstinence is meant to help the heart and mind centre on God – on what he would give us, make us and do through us. Without such sincerity of spirit and purpose we could just become hypocrites and we know just what Jesus thought of them! So each of us needs to ask ourselves, yet again, will my Lenten observances open my life to the will and way of God? Will Easter find me more Christ like? In all your duties and responsibilities, in the house of God, may this Lent help you come to know Jesus more clearly, love him more dearly and follow him more clearly. I noticed when reading the last AGM minutes that I had set you all a task of learning the virgers prayer, although I haven’t tested you all on it. I still believe that it is something that you ought to be able to do to enable us to say the prayer at meetings such as these without having to read it. So I would like you all to have another go at learning the Vergers Prayer. As vergers, many people greet and meet you before they see the clergy. A smiley face welcomes them more than anything else. Try to make good eye contact with these people and look interested in these people. As vergers this is an important task. We don’t preach to them, just talk and many things will happen. Nowadays people do not have time for others. Please make the time. Do something to help some people enter a church. Maybe they have not been in many years. They only come to weddings and funerals. Do look like you are enjoying your liturgical role. Our role as vergers is to pull back the curtain of the church so that others may see God. As you pull back the curtain wrap yourself in it so that you remain unseen and that the glory of God can be revealed. I suppose that for many of you Delia Smith is not only a generous supporter of Norwich City Football club but also a cook who produces food that is good to eat. Did you know that she is also a Christian writer on prayer? Now that the clocks have been put back and the evenings are getting longer, our thoughts turn to Advent and its preparation for celebrating Christmas. Some years ago Delia produced a book “A feast for Advent” for the Bible Reading Fellowship and if you can get a copy I thoroughly recommend you to buy it and use it as part of your Advent Reading. Let me quote a passage from its introduction written by Bishop David Konstant. “Advent can be an exciting time for us. It is a time to come afresh to God’s Word because it is a time of new beginnings. With Isaiah and Mary and all creation we wait expectantly for a birth. Every birthday is a time of wonder and hope, but surrounding this birthday is a simple breath-catching expectancy, for it celebrates the birth of God’s son, the Word made Flesh. Delia’s faithful journey through Advent touches the season beautifully” It is essential that as busy people there should be some time for quietness and prayer before you get involved in all the business of extra services and duties placed upon Virgers during the Advent and Christmas seasons. Each year as we approach this time of new birth and new life we must pray that God will come to us in a meaningful way. Never forget that he always has more of himself to give us, more to say to us and more to teach us. May you all have a fruitful Advent and Holy and blessed Christmas. St Albans Dioscesan Guild of Vergers Copyright © 2018. All Rights Reserved.